If you’re wondering how to accept credit card payments on your website using WordPress, Cardconnect and Woocommerce, the video in this post will show you how. This is a step by step tutorial. 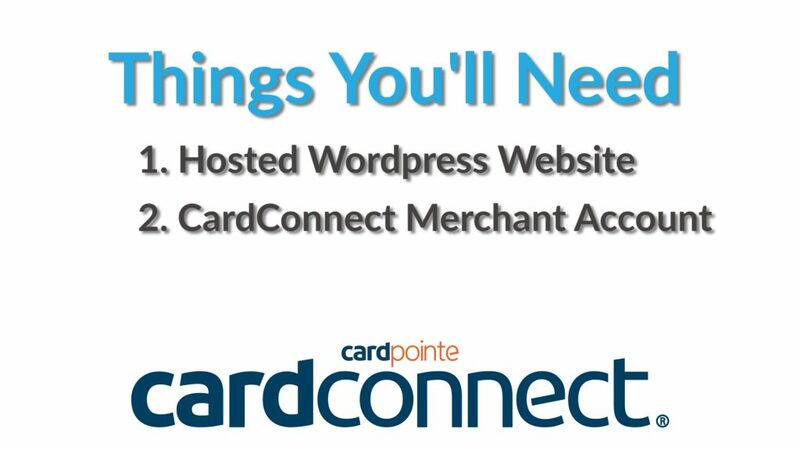 I’m gonna show you how to take your WordPress website, your CardConnect merchant account hook them together so you can accept payments for YOUR products or services on your website. I’m gonna show you how to set up payment pages like this and we’re gonna use “Off the shelf” tools to do it. No custom coding or programming needed. #1- a hosted wordpress website with a theme that is WooCommerce compatible along with the WooCommer ce Plugin which is FREE (and I’ll show you how to download that in just a minute). You’ll need a website that is already set up. Not a free one from wordpress.com but one that is hosted with a company like Siteground or Bluehost. I’m NOT going to cover website setup or merchant account setup in this video… so if you need those things first, check out the links in the description for help. The rest of the tools to make all of this happen you can download and install as we go. So we’ll take your WordPress company website and your CardConnect merchant account, and link them together through the use of the CardConnect WooCommerce plugin. STEP 1: Is to email CardConnect to request the WooCommerce credentials. These credentials are simply numbers and codes that you’ll plug in to the WooCommerce plugin to make it active. In the email, you’ll request both the PRODUCTION environment and the LIVE environment credentials. You’ll need to specifically mention your Merchant ID number and your company name in the in the email. The CardConnect email address to send your request to, is linked in the description. The emails you’ll get back will look something like this. Once you have both of them, you can begin configuring the plugins. Click the Install Now button and then immediately click Activate. Again, click the install button and then immediately click activate. If it’s the very first time you’re installing the WooCommerce plugin on this domain, it will direct you to the setup wizard. First is the page setup which gives you the pages that are going to be adde d to your site. Then select if you are charging sales tax and continue. The final step of the setup wizard is to click the Create Your First Product button. 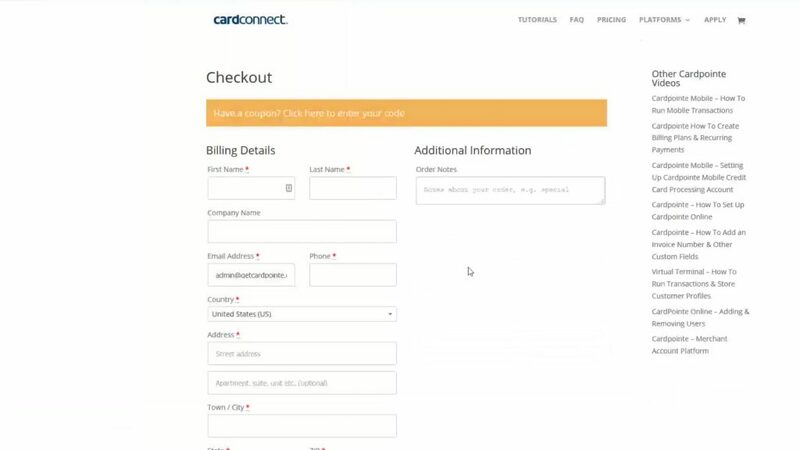 Before we create a product, let’s configure the CardConnect payment plugin. From the Main menu, under WooCommerce tab, select SETTINGS. 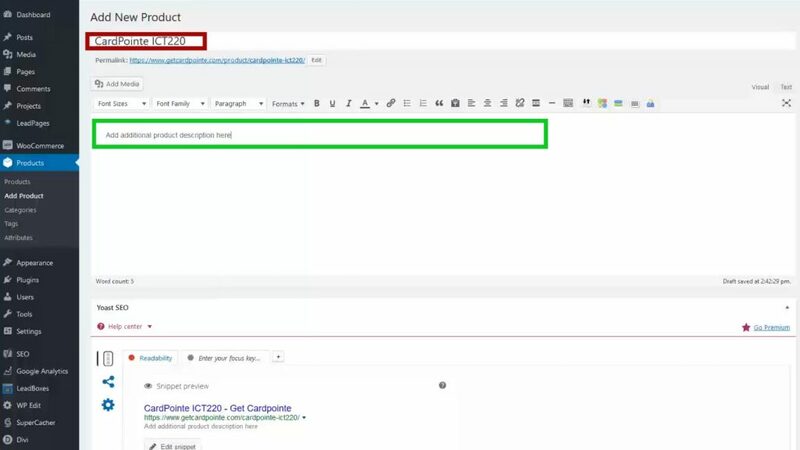 Next select CHECKOUT from the top menu and click on CARDCONNECT from the Checkout options subtab. Checking this box will allow you to toggle back and forth between a testing environment (which is also known as a sandbox environment) and the LIVE mode. If you have the need to test first, you can plug in the testing credentials here. For this video I’ll toggle to LIVE. So I’ll put in the Live Merchant ID Number, The Username, both contained within the email from CardConnect, and the Live Password which can only be given by phone, to authorized account representative. You’ll Enter the Site ID here, also found in the CardConnect email. Come down and click save. After that, come over to the CheckOut Options and scroll down to make sure that CardConnect is the default payment method. If that is the only option you want to have, make sure that you unselect Check Payments and Paypal by going into each page and unchecking the Activate button. 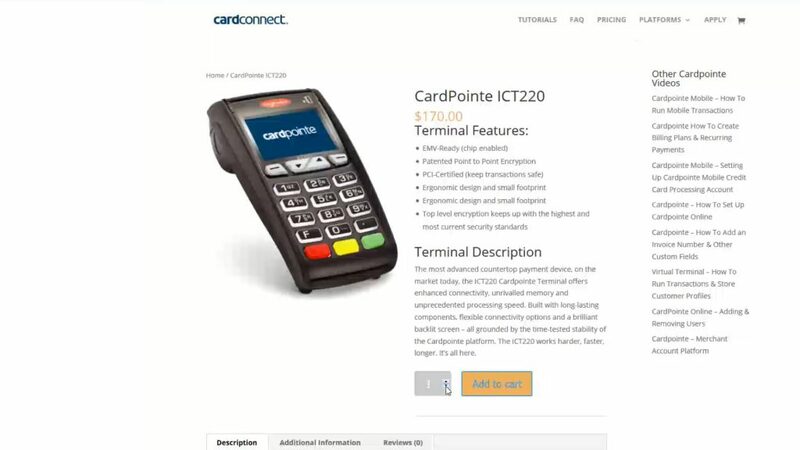 Then, CardConnect will be the default merchant account for all payment through your website. To demonstrate the functionality and show you what the pages look like, we’ll create a product. Put the Main product description here and I’ll show you where all of this appears on the live page in just a second. Click Publish and you can then view the product live on your site. You can give people a specific url now, which can look similar to this page here and you can also make this product searchable on your website and on search engines like Google. Your customer will see a page like this on your site, and follow this process to check out. You have a quantity selection and an ADD TO CART button that when selected takes you to your cart page. Click Proceed to checkout and this is where your customers will fill in their payment information to complete the purchase. And that’s how simple it can be! You can replicate this process for as many products and services as you would like to have on your website. The design of the product pages are specific to the WordPress theme that you have and CAN be customized by a developer and designer if you’d like, but the functionality of the Cardconnect integration with WordPress and Woocommerce will be the same as I just demonstrated. There are a lot more customizations that you can do to WooCommerce like adding shipping calculators for various products, adding digital downloadable products and even adding membership permissions if your business has a membership component to it. If you have any questions about the customizations or installation of these digital tools, please don’t hesitate to reach out or comment below. The plugins and resources showing in this video are all linked below, including the page shown in this video. If you found this helpful, Please hit that red subscribe button so you’ll get future tutorials on setting up payment pages, invoicing tools, and merchant account best practices. Also, be sure to like the video and share it with your friends. Until next time, I’m Brian Manning and I’ll see you on the next video.